Buck Boylan’s writing career began in a Vo-Tech high school, showing his writing skills with creative details in many over the top essays, which included the subjects of Geography, Weather events and Physics. After high school, he spent several years at Bethlehem Steel Corp. taking classes all year round in creative writing as well as many Microsoft Office programs. In 2016, Buck completed an on-line college course “Publish and Sell Your E-Books”. In early 2017, he completed another on-line college course “Using Social Media in Business”. His accomplishments include published articles in sixteen national magazines and several local newspapers. Mr. Boylan was the Editor for “The Educator” newsletter at Bethlehem Steel in Sparrows Point, MD. Buck has now published two books in two years, “The Humorous Side of Trucking” (2016) and his latest work, “Bruce the Fire Dog Saves Christmas” (2017). The picture perfect, beautiful, agricultural setting of central northern Maryland, makes a specular backdrop for him to continue to produce his written works. Bruce the Fire Dog Saves Christmas is a children’s holiday story book written by Buck Boylan. There were still two weeks left before Christmas Eve, and the elves in Santa’s toy factory had been working full-time to get everything ready for the big night. Now the factory elves were sleeping in Santa’s house until it was time to wake up again and start a new day. The reindeer were in their barn, a big and brightly colored building where they ate, slept, and even had a heated pool to exercise in, and elves were busily cleaning their straw bedding and replacing the old bedding with new, clean straw. Bruce the Fire Dog was taking some time off from his rounds and relaxing a bit inside the Reindeer Barn after he had taken a refreshing dip in the pool. As he rolled around in the clean straw, his senses instantly went on alert -- he could smell smoke! As he watched in horror, sparks flew off one elf’s pitchfork and landed on dry straw. And that was the beginning of a devastating fire storm at Santa’s Toy Factory. Bruce tore through the barn to get to the fire bell tower. He rushed up the stairs and jumped high to grab the rope for the fire bell. Bruce tugged with all his might to make the bell ring loud and true. Soon, the North Pole Fire Department and townspeople were out and doing their part in putting out the raging fire, but the factory had been burned to ashes and Santa’s favorite reindeer were singed and injured. What would happen to Christmas this year? Can Christmas be saved? 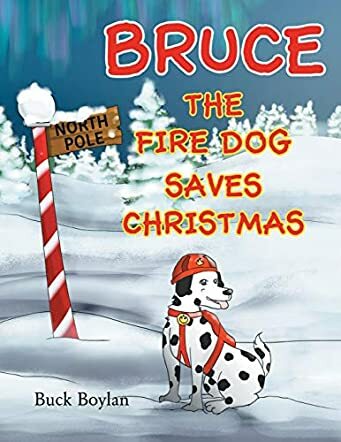 Buck Boylan’s humorous action holiday book for children, Bruce the Fire Dog Saves Christmas, gives readers a first-person account of the fire and the resulting efforts made by Santa and his team to save Christmas as told by Bruce the Fire Dog. Bruce is a Dalmatian who takes his job very seriously, and his vigilance and prompt action does save Christmas, but he gets a bit of help from Bob the Elf, Bob’s crackerjack team of super reindeer, and a heavenly host of angels. Children who enjoy stories with excitement, action and adventure will love this story that shares the inside scoop of what goes on at the North Pole in a fun and original way. Boylan’s story is suspenseful, and it nicely celebrates the natural diversity of our world. The illustrations are great fun and an excellent accompaniment to the story as it unfolds. I found myself referring to them repeatedly as I read. Bruce the Fire Dog Saves Christmas is most highly recommended.